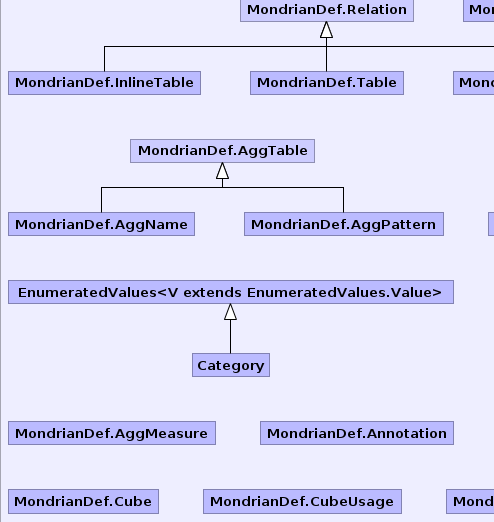 Mondrian's core package, this defines connections and the catalog metamodel, and allows you to execute queries. Describes an aggregation operator, such as "sum" or "count". An element that has annotations. User-defined property on a metadata element. A Axis is a component of a Result. AxisOrdinal describes the allowable values for an axis code. API for controlling the contents of the cell cache and the member cache. An operation to be applied to the member cache. A specification of a set of members in the member cache. A Cell is an item in the grid of a Result. Connection to a multi-dimensional database. A Dimension represents a dimension of a cube. A Value represents a member of an enumerated type. An Evaluator holds the context necessary to evaluate an expression. Interface for evaluating a particular named set. Interface for generically evaluating a set. An Exp is an MDX expression. A FunCall is a function applied to a list of operands. Definition of an MDX function. List of all MDX functions. Builder that assists with the construction of a function table by providing callbacks to define functions. A Hierarchy is a set of members, organized into levels. A Level is a group of Members in a Hierarchy, all with the same attributes and at the same depth in the hierarchy. A Member is a 'point' on a dimension of a cube. Represents a place that properties can be read from, and remembers the timestamp that we last read them. Description of the version of the server. A named set of members or tuples. Naming context within which elements are defined. Allows expressions to be evaluated native, e.g. An OlapElement is a catalog object (dimension, hierarchy, level, member). CUP generated interface containing symbol constants. A Position is an item on an Axis. A Result is the result of running an MDX query. A Role is a collection of access rights to cubes, permissions, and so forth. Represents the access that a role has to a particular hierarchy. 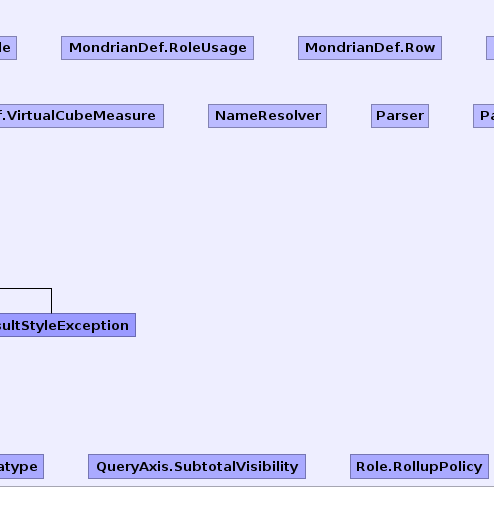 A Schema is a collection of cubes, shared dimensions, and roles. 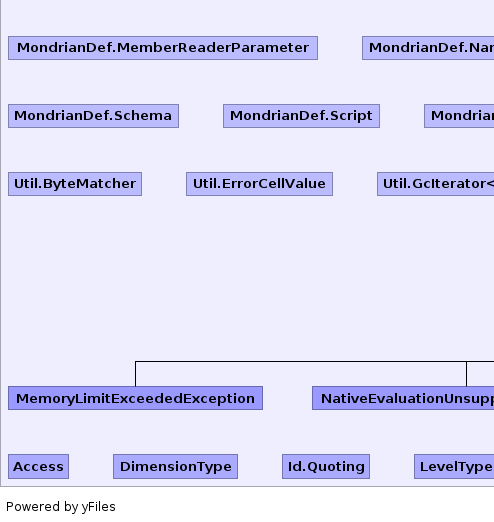 A SchemaReader queries schema objects (Schema, Cube, Dimension, Hierarchy, Level, Member). Provides context necessary to resolve identifiers to objects, function calls to specific functions. An object which implements Walkable can be tree-walked by Walker. 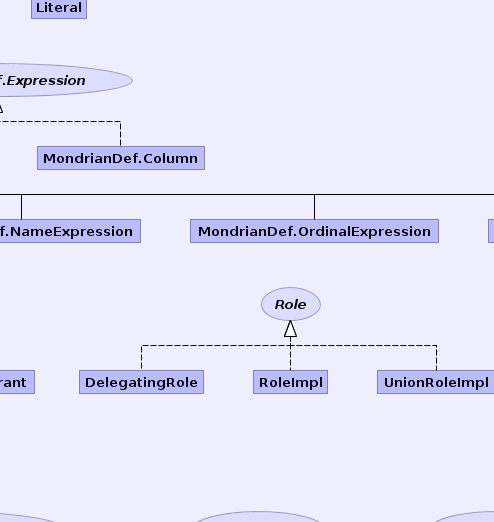 Category enumerates the possible expression types. ConnectionBase implements some of the methods in Connection. CubeBase is an abstract implementation of Cube. Cup generated class to encapsulate user supplied action code. DelegatingRole implements Role by delegating all methods to an underlying Role. DelegatingSchemaReader implements SchemaReader by delegating all methods to an underlying SchemaReader. Abstract implementation for a Dimension. The basic service for managing a set of OLAP drivers. EnumeratedValues is a helper class for declaring a set of symbolic constants which have names, ordinals, and possibly descriptions. BasicValue is an obvious implementation of EnumeratedValues.Value. Skeleton implementation of Exp interface. Holds information necessary to add an expression to the expression result cache (see Evaluator.getCachedResult(ExpCacheDescriptor)). A Formula is a clause in an MDX query which defines a Set or a Member. Identifier segment representing a key, possibly composite. MemberBase is a partial implementation of Member. Member property or solve order specification. 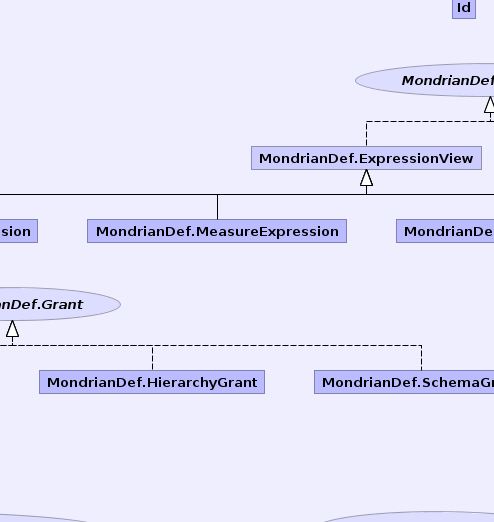 This is the XML model for Mondrian schemas. The name of the column mapping from base fact table foreign key to aggregate table foreign key. A definition of an aggregate table for a base fact table. Property of a calculated member defined against a cube. Plugin that formats the values of cells. Specifies the transitive closure of a parent-child hierarchy. A CubeDimension is either a usage of a Dimension ('shared dimension', in MSOLAP parlance), or a 'private dimension'. Grants (or denies) this role access to a cube. A Dimension is a collection of hierarchies. Grants (or denies) this role access to a dimension. A collection of SQL expressions, one per dialect. Grants (or denies) this role access to a hierarchy. Grants (or denies) this role access to a member. Defines a named set which can be used in queries in the same way as a set defined using a WITH SET clause. 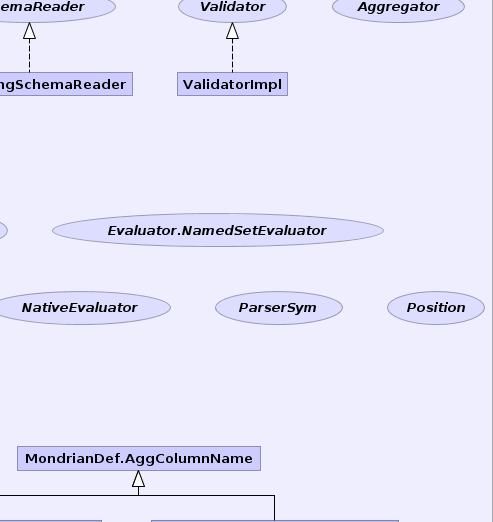 A Parameter defines a schema parameter. A role defines an access-control profile. Row definition for an inline table. A schema is a collection of cubes and virtual cubes. 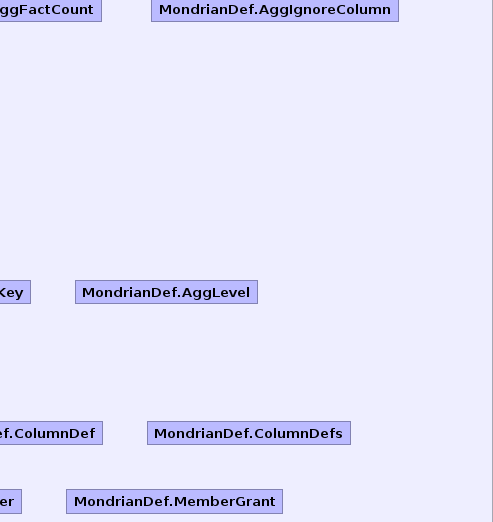 Grants (or denies) this role access to this schema. 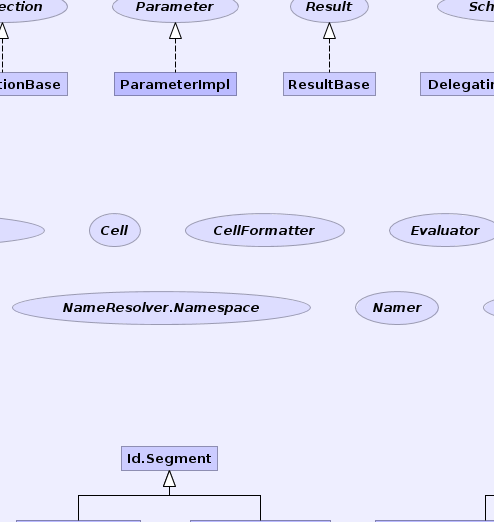 Script fragment to implement an SPI such as user-defined function, member formatter, cell formatter. Body of a Role definition which defines a Role to be the union of several Roles. 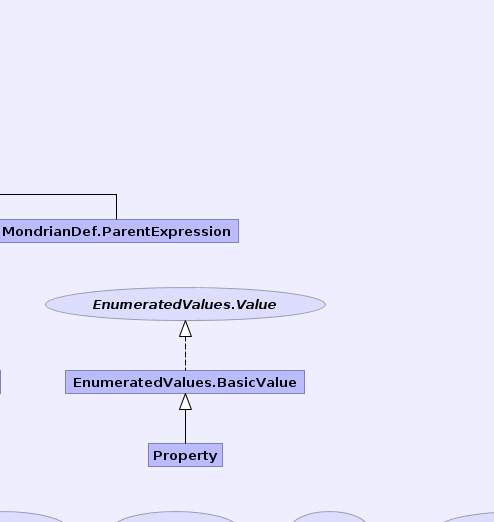 A UserDefinedFunction is a function which extends the MDX language. Column value for an inline table. A collection of SQL statements, one per dialect. A VirtualCube is a set of dimensions and measures gleaned from other cubes. A VirtualCubeDimension is a usage of a Dimension in a VirtualCube. 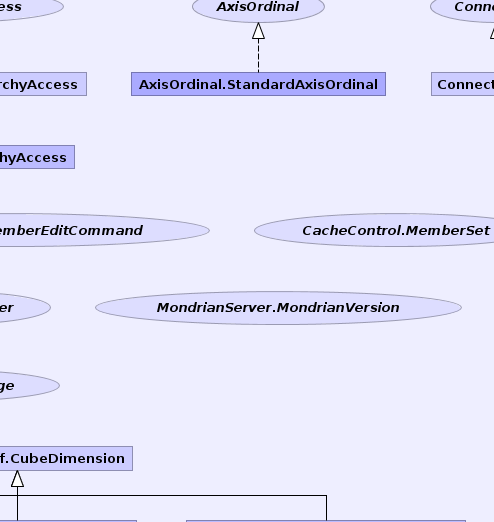 Configuration properties that determine the behavior of a mondrian instance. 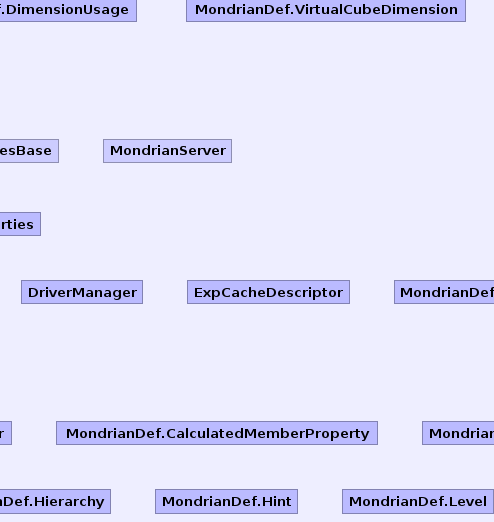 MondrianProperties contains the properties which determine the behavior of a mondrian instance. 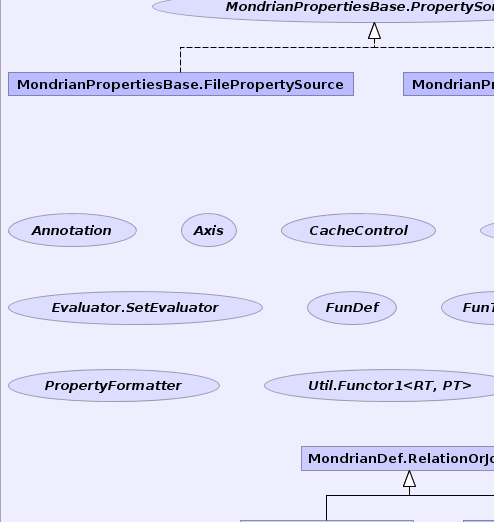 Implementation of MondrianPropertiesBase.PropertySource which reads from a File. 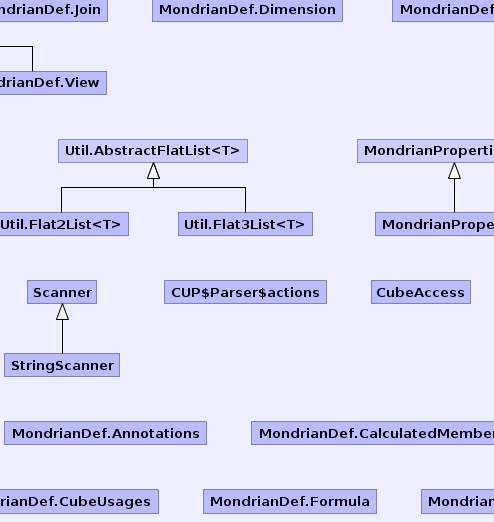 Implementation of MondrianPropertiesBase.PropertySource which reads from a URL. Interface by which to control an instance of Mondrian. Resolves a list of segments (a parsed identifier) to an OLAP element. 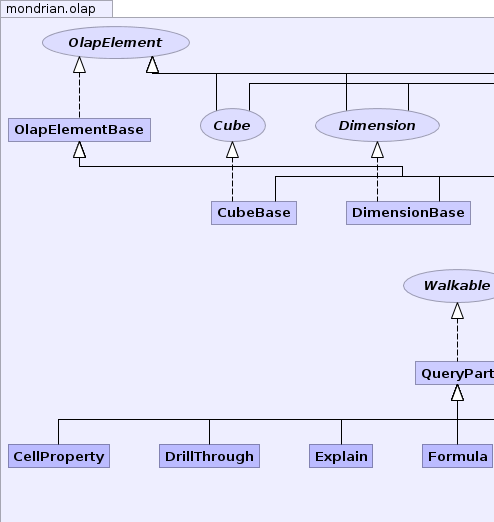 OlapElementBase is an abstract base class for implementations of OlapElement. Property is the definition of a member property. Query is an MDX query. 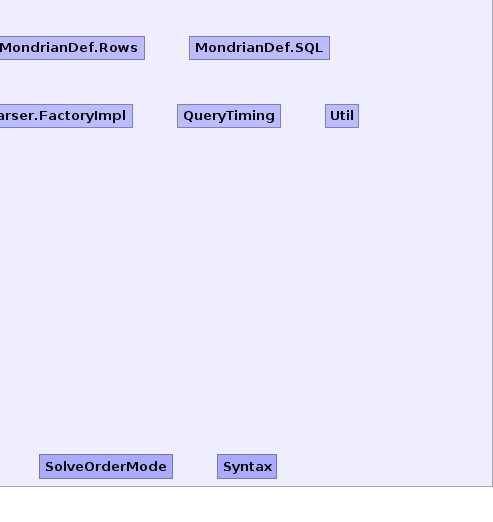 Component of an MDX query (derived classes include Query, Axis, Exp, Level). Provides hooks for recording timing information of components of Query execution. Default implementation of the Role interface. 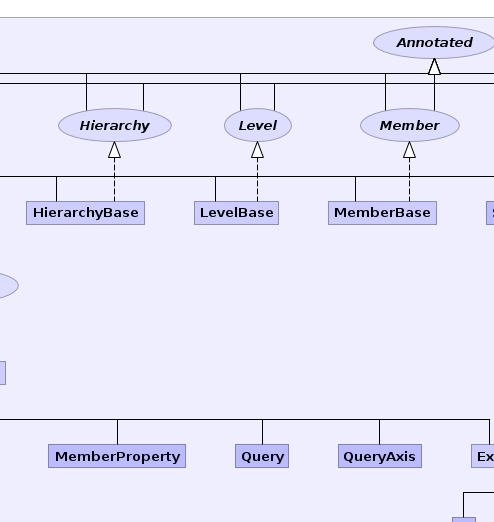 Implementation of Role.HierarchyAccess that caches the access of each member and level. 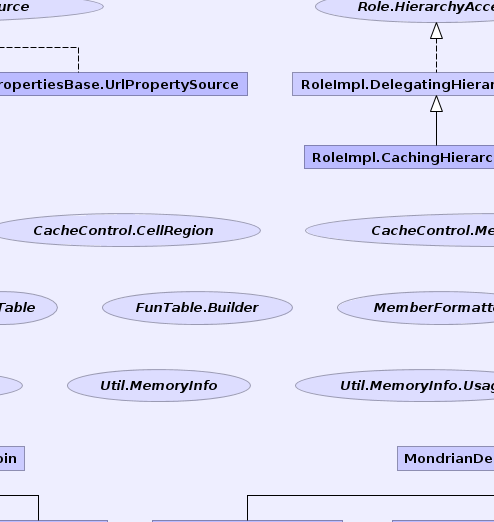 Implementation of Role.HierarchyAccess that delegates all methods to an underlying hierarchy access. 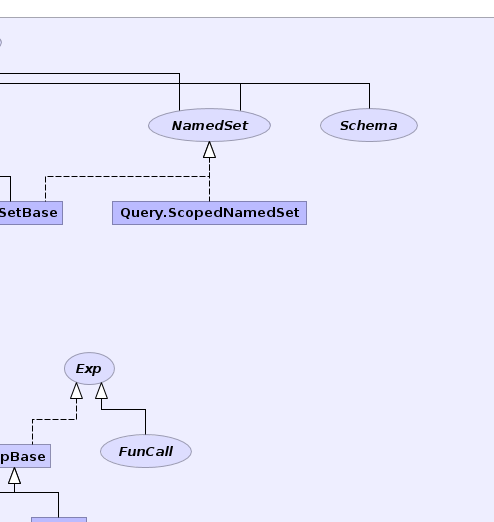 Skeleton implementation of NamedSet interface. Lexical analyzer whose input is a string. 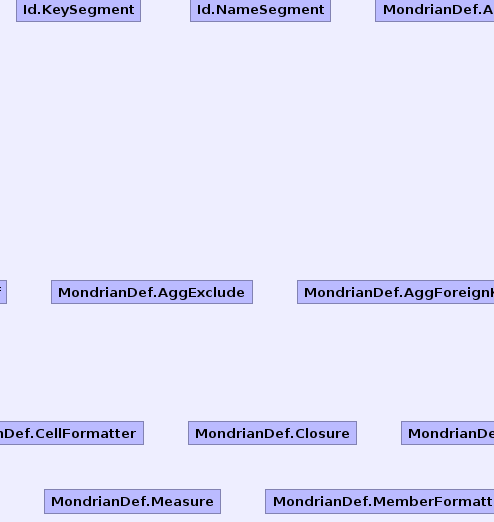 Utility functions used throughout mondrian. This class implements the Knuth-Morris-Pratt algorithm to search within a byte array for a token byte array. List that stores its two elements in the two members of the class. List that stores its three elements in the three members of the class. PropertyList is an order-preserving list of key-value pairs. A Comparator implementation which can deal correctly with RolapUtil.sqlNullValue. Walks over a tree, returning nodes in prefix order. Access enumerates the allowable access rights. Enumerates the types of dimensions. Will be replaced with Level.Type before mondrian-4.0. MatchType enumerates the allowable match modes when searching for a member based on its unique name. Scope where a parameter is defined. SubtotalVisibility enumerates the allowed values of whether subtotals are visible. Enumeration of the policies by which a cell is calculated if children of a member are not accessible. Strategies for applying solve order, exposed via the property MondrianProperties.SolveOrderMode. 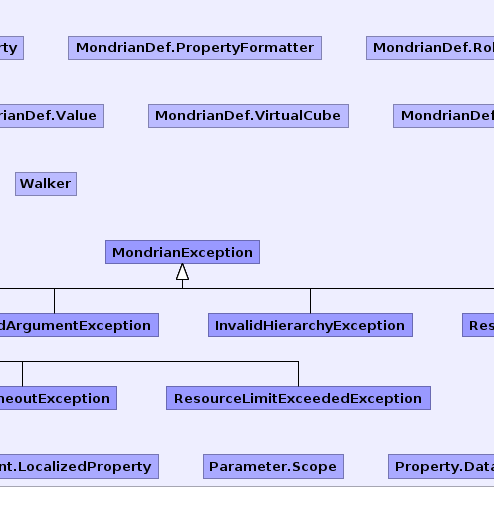 Exception which indicates that a Cube is invalid because there is a hierarchy with no members. Exception which indicates some resource limit was exceeded. 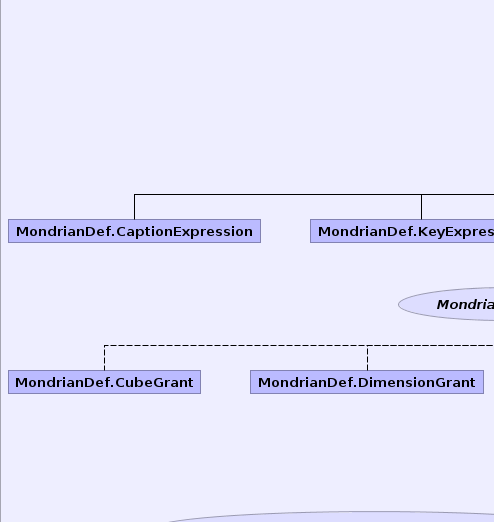 Instances of this class are thrown for all exceptions that Mondrian generates through as a result of known error conditions. 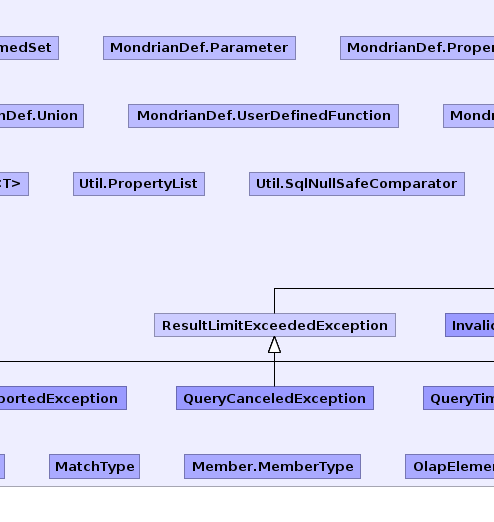 Exception which indicates that native evaluation of a function was enabled but not supported, and MondrianProperties.AlertNativeEvaluationUnsupported was set to ERROR. Exception which indicates that a query was canceled by an end-user. Exception which indicates that a query executed for longer than its allowed time and was automatically canceled. Abstract base class for exceptions that indicate some limit was exceeded. Exception that indicates a compiler could not implement an expression in any of the result styles requested by the client.